Rated 4 out of 5 by pennmom36 from FULFILLING THE PROPHECY...........AGAIN The Fire Kingdom is the only Kingdom remaining. All other Kingdoms have been systematically destroyed by the Cursed Princess, as she emphatically pursues her quest to take back what she believes is rightfully hers. The Cursed Princess has proclaimed herself Queen Mortis, a mistress of Illusion, a master of evil deception, and she'll stop at nothing to obtain the final Princess of Fire. (that's you!) The Princess of Fire has evoked protection from the Spirits of Mystery, to protect the Kingdom, but does little to protect her when she's forced to enter a portal to the Metal Kingdom, to save her beloved Nanny from the evil clutches of Queen Mortis herself. Can the Princess of Fire expel the Cursed Princess forever, and put an end to the war that's been raging for over 500 years? There's something different about this Spirits of Mystery game, something's just a bit "off" I'm not sure what it is, perhaps the storyline is just stale, it seems as though we've had the battle of good Princesses against evil Princesses for over 500 years ourselves. Perhaps the graphics threw me off, they haven't improved either. More than likely, it's because Spirits of Mystery has become far too gimmicky. Supposedly the Prophecy tells of a Princess, armed only with a Bow, will expel the Cursed Princess forever. But the Prophecy didn't mention she would also have a Magic Mirror! I don't understand why ERS feels the need to include this "Mirror" in every series. You know the one, the one you have to use to "catch" the evil entities to dispel the curse, but you can only see them through the mirror a.k.a Orb Catcher. There is a Morphing Object in almost every scene, but you can only collect it when it's in the shape of a bright red triangle emblem, which makes it difficult not to spot. Most of the scenes also have a collectible Jigsaw Puzzle Piece, some of which are available in the scene itself, some are within a zoomed in zone. Once you have collected all 6 puzzle pieces, you can assemble the super easy puzzle and use it for a screensaver. 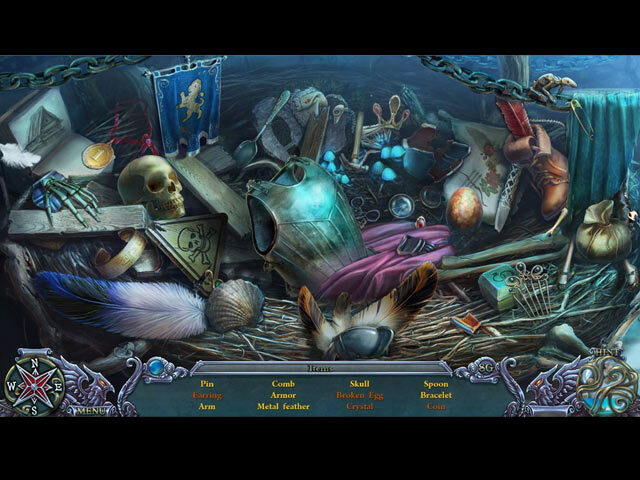 (there are 6 different puzzle screensavers, each containing 6 pieces) The Hidden Object Scenes are varied each time, and in true ERS form, some scenes are repeated in the same area, a feature I find very boring the second time around. There are Keywords to find during a story, Multiples of the same item finds, Silhouetted Shape finds and Interactive List finds. The Mini Games are quite easy for the most part, some of them are impossible not to solve, because they light up in neon green. Below are brief descriptions of some of the Mini Games you'll encounter during the demo: 1) Hit all 3 targets with your family Bow and Arrow (hard to miss targets) 2) Turn disc sections until they click into the correct position, using directional arrows. (again, all you have to do is click an arrow all pieces fall into place and turn green) 3) Move a tile to an empty place to slide square tiles to complete the image. The second half of the puzzle requires you to flip over all tiles, clicking one tile may affect others. 4) Use your magic mirror to find 6 evil illusions. This mini game is played every time you come across a human who has been cursed by the Queen's illusion. 5) After finding all 6 illusions, the mirror shows you a chain that you must trace its path without being hit by a floating orb. 6) After tracing the chain, you must then find that persons most treasured items, which are highlighted on or around them, and return them. 7) Use directional arrows to find the constellations shown in the inventory bar. 8) Move the lines so they don't cross over each other by moving connectors to an empty slot. 9) Place tiles on the board based upon their symbols, all tiles must be used. SPIRITS OF MYSTERY GAMES AVAILABLE: Amber Maiden (CE 1-5-12) Chains of Promise (CE 8-13-15) Family Ties (CE 3-24-16) Illusions (CE 6-15-17) Song of the Phoenix (CE 4-12-12) The Dark Minotaur (CE 12-27-12) The Fifth Kingdom (CE 1-12-17) The Silver Arrow (CE 12-12-13) This Collector's Edition has 11 Movie Videos, 13 Wallpapers, 23 Concept Art pictures, 6 Screensavers (collect all 36 puzzle pieces to assemble) 4 Music Soundtracks, 15 replayable Mini Games, 22 replayable Hidden Object Scenes, 14 Achievements to earn, Morphing Objects, a built in Strategy Guide and a Bonus Chapter, enjoy! Rated 2 out of 5 by Geollyn from Wait for the standard edition I was disappointed in this Collector's Edition. First, I've noticed a trend where games in a series get darker and darker (more evil as you go further), this game was no exception. What use to be a light fun romance HO game, was dreary and pathetically easy. Additionally, this game was NOT worth the CE. The morphing objects and collectibles were so easy to find there was no fun in gaining achievements. :( Perhapys the SE when it comes out, but on sale! Rated 2 out of 5 by Torpedo1 from The worst of Illusions You know when the series first started out it was quite good. I think the follow up version would have been better if her romance with the prince she was getting married to blossomed into an adventure for the two of them. This game was ok but I got bored. Not going to touch on the has and has not but try it for yourself. Goes on the bottom of my to buy list and probably only on sale. Rated 2 out of 5 by karenmusik from Sigh. Disappointed Again I used to love this series. The last few games have been less than noteworthy, so the pretty good reviews got me a bit excited. However: The magic item uses the same mini-games throughout HOPs not that interesting Sliders and bubble shooters? Really? HATE those and skipped. Collectibles not worth the CE price Sorry - no buy for me. Rated 2 out of 5 by Granny_Gruff from Spirits of Mystery is Back... Why? Once again we have a princess in peril, Nanny to advise, Isla to be evil with greater evil behind him, and a rehash of the same story. There will be endless broken items to be fixed, puzzles, HOPs, and bits and pieces to collect. You will have collectible morphing objects that must turn into a flaming triangle to be "collected" - you can't miss them. There are also puzzle pieces to collect and a puzzle to complete each time you free someone from a spell. And once again I am trying to make sense of the whole premise. We have chatty Nanny and nasty Isla returning to the same roles they played in the previous S of M games, yet we seem to have a different princess in a different kingdom in a different magical world. There does not seem to be any point in listening to Nanny's endless monologues or trying to make sense of what you must do to get through this game in the preordained order devised by the Devs. I'm sorry, but I just don't want to slog through this again. No Sale. Rated 2 out of 5 by mmdgaston from really awful.... this was a very boring game, worst in this series. forever on one task, zero storyline. same old puzzles. sad, this was at one time a good series. play at your own risk. Rated 2 out of 5 by campingramps from This game bored me mindless As soon as i saw the opening scene I knew this was not a game I would enjoy let alone buy. The colors are a complete wash out and the characters are a joke. It is beyond my minuscule mind to try and figure out how a game this poor becomes the game of the day. The voice of the main character is annoying and is more of a haggled old witch than a handmaiden. The one other voice I heard was just as bad. The biggest drawback, other than the lame story line, is the graphics. It is as though they painted these colors on the easel and then went back over them with a damp cloth and wiped all the color off. Left everything with a sickening bluish tint with very little other color. Not pleasant at all. HO's are way below average and with the washed out colors some of the items are difficult to find. Mini games aren't any better. I'm not going to sit here and write an extremely long and unnecessary description of the game as I know someone else will so all I will say is save your credits or money for something better. Which would be almost any other HOG out there. Obviously, I do not recommend this game at all unless you are a fan of washed out tired games. Have fun? I doubt it. Rated 1 out of 5 by irlandesa from Really Stupid plot I usually like this series, but the plot was so awful I actually couldn't finish the game. I gave up in the middle because I was too annoyed to keep going. So disappointing that a series lost so much quality from one game to the next. Rated 1 out of 5 by jbeckman01 from This was just plain awful! I played the game all the way thru and hated it. It was so boring, I wished I hadn't bought it. I tried playing the bonus game but I was so done with the whole game that I just quit. Rated 1 out of 5 by pcpat923 from WATER, WATER, EVERYWHERE AND NOT A DROP TO DRINK! So many games and nothing to buy. ERS has the same voices, same artwork, same here's the bad guy, here's the good guy. Now, go through an entire game chasing the bad guy with no plot and the same old boring, repetitive actions. Only difference in this game is it's got to be the worst I've ever played and I've played all of their games and purchased more than I'd care to admit. There was a time I had to decide on which to afford because there were so many from which to choose and I wanted to buy them all. Well, that problem is solved. Reviews that stated "save your money" usually irritated me. Hey, if I want to throw my money away, that's my business. That problem is solved too. I now agree. I'll save my money. This latest ERS game could be the very worst ever in their long career and they've come up with many excellent series that took a nose dive such as the Haunted Legends, Fear For Sale, Redemption Cemetery to name a few which were very good at first. Haven't been able to purchase a palatable game in over a year. Please, ERS, present something different, fun and interesting! Take a look at other excellent developers--5-BN Games, Artifex Mundi, Jet Dog Studios, Inertia, Elephant Games. I'm still here waiting and wanting to buy one of your games. Enjoy! Rated 1 out of 5 by LunaNik from Same as the last few games. Review based on: full demo Overall rating: ? What my rating means: Derivative storyline and gameplay. Why bother? SHORT & SWEET SUMMARY REVIEW • Same characters: Princess, Nanny, Isa, Master Miscreant • Same story: Isa as the puppet to Master Miscreant. Princess must save the day aided by Nanny. • Same gameplay: Magical gimmick that detects evil/corruption. 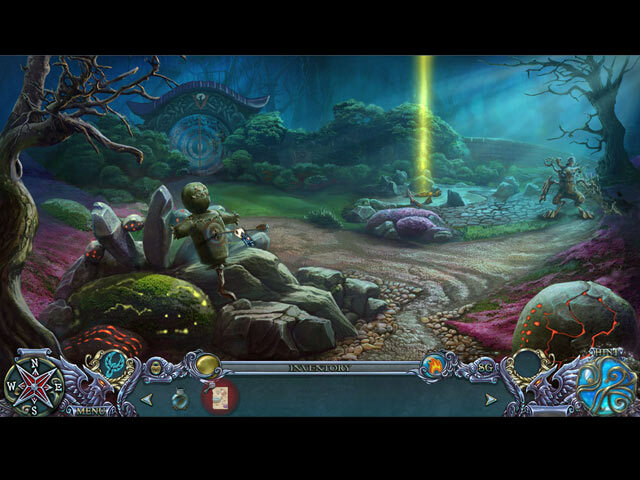 Unhidden object scenes. Simple puzzles. More details on the specific elements of the game below the fold… ———————————————————— STORYLINE All the other princesses have been captured by Queen Mortis and forced to wear Leeloo’s castoff wardrobe from “The Fifth Element.” Isa is still satisfied to play second fiddle to inept evildoers. You’re the only one who can save the known world, per the prophecy. Weirdly, your nanny is more knowledgeable and qualified than you are, except that she talks too much. GAMEPLAY You have not one, but two silly devices that take the place of actual gameplay. First, there’s the one that lets you see evil when you wave it around the scene. Oddly, it’s called a magic mirror, but you can see through it. Second, there’s your father’s bow, with which you’re allowed your choice of targets. Woo hoo. HO scenes offer various presentations but no hidden objects. There are interactive lists, silhouette lists, storybook narratives, multiples of one object, and constellation patterns. Puzzles are nearly all retreads and easy. 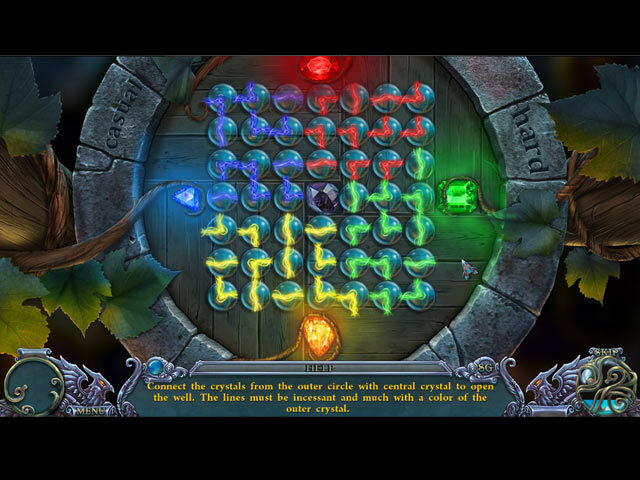 I encountered a 16-piece slider, a version of All Lights On, untangle the ropes, matching pairs, copy the given clue, rotating rings jigsaw, the repeating puzzles that accompany the magic mirror and bow, and finally, the only enjoyable one: Use the domino-like tiles to correctly fill in the grid. Some dominos can fit in more than one space. I enjoyed this game when it appeared in "Return to Ravenhearst," too, on the door to Victor’s cottage. PRODUCTION This series always goes back to the painterly style of old ERS games, which I don’t have issues with. There are only four soundtracks, so the music becomes repetitive fairly quickly. The voiceovers are mediocre, in my opinion. EXTRAS Bonus chapter which you play as the nanny, strategy guide, performance achievements. Collect puzzle pieces and morphing objects. Replay HO scenes and puzzles. The dev’s portfolio includes wallpapers, screensavers (only if you collect the puzzle pieces), movies, concept art, and soundtracks. CONCLUSION This storyline has been beaten to death in this series, and there’s nothing innovative in the gameplay. I’d rather give my money to a dev who’s being creative. Sorry, but boring, easy, and full of gimmicks means one star, not four or five. Rated 1 out of 5 by ZekesPeach from All you do is talk, talk, talk... I lasted about 20 minutes in the demo before I had to stop...I was about to tear my hair out. From the outset, Nanny feels compelled to converse, and nothing else can happen until you give in and either hear her out or hit the skip button. And I do mean NOTHING else can happen. You can't click on the morphing object, or the puzzle piece, or anything else until you obey what the developers did to lessen the amount of programming they would have to do had they allowed you to choose what you wanted to do in a different order. The graphics are outdated. The storyline is boring and overused. Pretty much everything needed to advance requires finding bits and pieces, then assembling, then looking for tape or whatever to hold the repairs together, then putting the repaired item with another item, and then finally getting to use it. So far it has been all magic bows and arrows. Yawn. Frankly, I was surprised that the first review garnered 4 stars when the reviewer pretty much panned the game. This series needs to be retired.